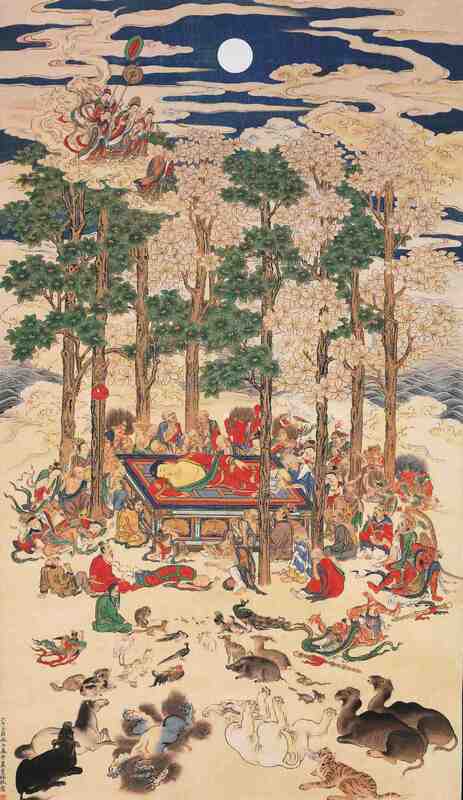 From “The Death of the Buddha” by Mori Tetsuzan (1775-1841). “The Price Collection: The Buddha and the Floating World” will be on view at the Japanese American Cultural and Community Center’s George J. Doizaki Gallery, 244 S. San Pedro St. in Little Tokyo, from Sept. 18 to Oct. 16. This extraordinary exhibition was envisioned by world-renowned collectors Etsuko and Joe Price. It features silk scroll paintings depicting the everyday life of the Edo period (1615–1868) and divine images from the Buddhist world with an ikebana flower arrangement installation by three ikebana schools – Ikenobo, Ohara-Ryu, and Sogetsu. Opening reception will be held Sunday, Sept. 18, from 1 to 3 p.m.
Free admission. Gallery hours: Wednesday through Sunday from 12 to 4 p.m., closed Mondays, Tuesdays and holidays. The exhibition is made possible in part by grants from Shin’ Enkan Foundation, The Henri and Tomoye Takahashi Charitable Foundation, and Japan Business Association of Southern California.